Instructions: Make a card base from white card stock measuring 7" x 5". Cut designer pattern paper 1/4 inch smaller than the card base and adhere on the card front vertically using the clear glue. Cut border dies about 3 inches broad and add diluted water colour in shades of pink and yellow on the border strip. Let it dry and then score on the scoring board at 1/4 inch intervals. Adhere this on the card front using foam dots. Stamp images of flowers from Classic Rose stamp in Vibrant fuschia color. Color the centre with yellow ink and shade the petals with the bright pink ink. Cut with coordinating die. Make a hole in the centre of each layer. Mist them with water and shape them in the flower shaping mold. Give them a shape further with the flower shaping tool kit. Layer two flowers together with clear glue. Pass yellow stamens through the center. Stamp leaves from the leaf stamp with Library Green and colour with Leaf green. 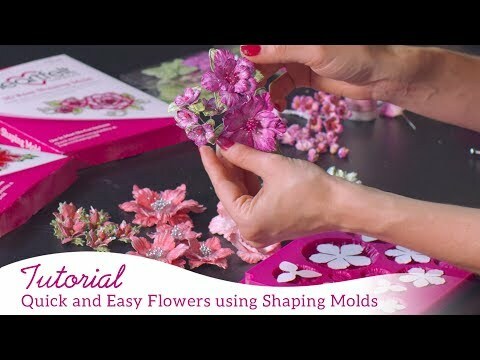 Cut with coordinating die and shape with the flower shaping tool kit. Stamp several images of the flowers from the Banners of Love stamp set in Library green and cut with matching die. Cut and oval die cut and apply versamark embossing ink on the edges. Put silver embossing powder and heat set. Cut two more layers in adjoining sizes from the oval set and stamp the Quote on the smaller layer and add stickles on the edges. Adhere on the bigger oval and adhere the whole oval set on the borders. 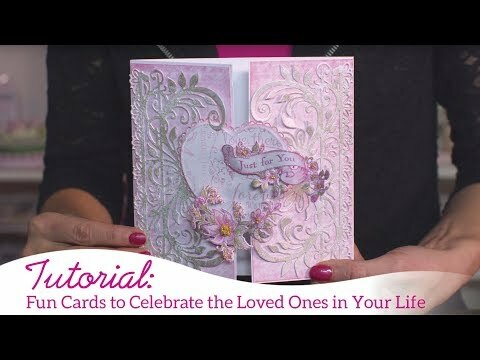 Add images of banners of love flower on the card as shown using foam dots. Add the flowers and leaves and white pollens to finish the card. Add clear water droplets near the quote.